Come by car, boat, motorcycle or snowmobile to the WingDam Saloon & Grill in beautiful Fountain City, WI! Yes, you can really get there in all those moods! 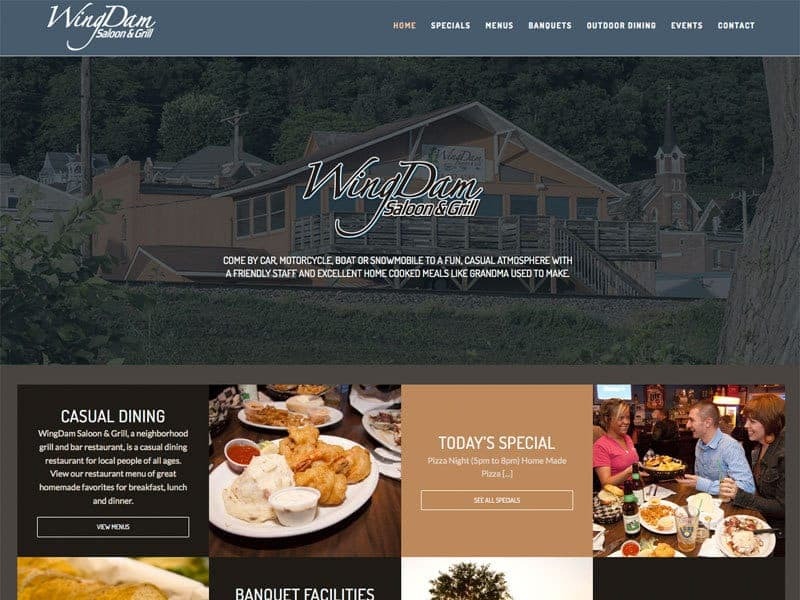 Celebrating their 10th anniversary this year, the WingDam continues to offer great food in a fun atmosphere. You can dine at the Wingdam Saloon & Grill for breakfast, lunch and dinner. Grab your friends for some cold ones and a friendly game of pool. Or relax on the deck with your favorite beverage and enjoy a gorgeous sunset over the water. With 10 years under the belt, it was time for an update. Our design team was able to transition the great photos and copy they already had into a very fresh new look. The site is now completely mobile friendly so travelers can easily view and navigate. We really love the look of the motion enhanced photography on the home page. (A new service from Vision Design Group.) Menus & Specials were upgraded so they can be edited at any time and an events page was added so staff can promote all the exciting things going on. CTA buttons were also added to guide visitors to learn more. Whew! Lots of great new changes! Before you hop in the boat, check out the wingdamsaloon.com! Ready for a new look? Want to add some cool new motion photography? Contact our team to learn more!